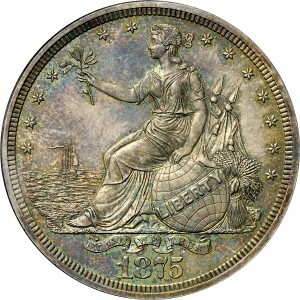 This is an outstanding example of the design, featuring Liberty seated by the seashore. 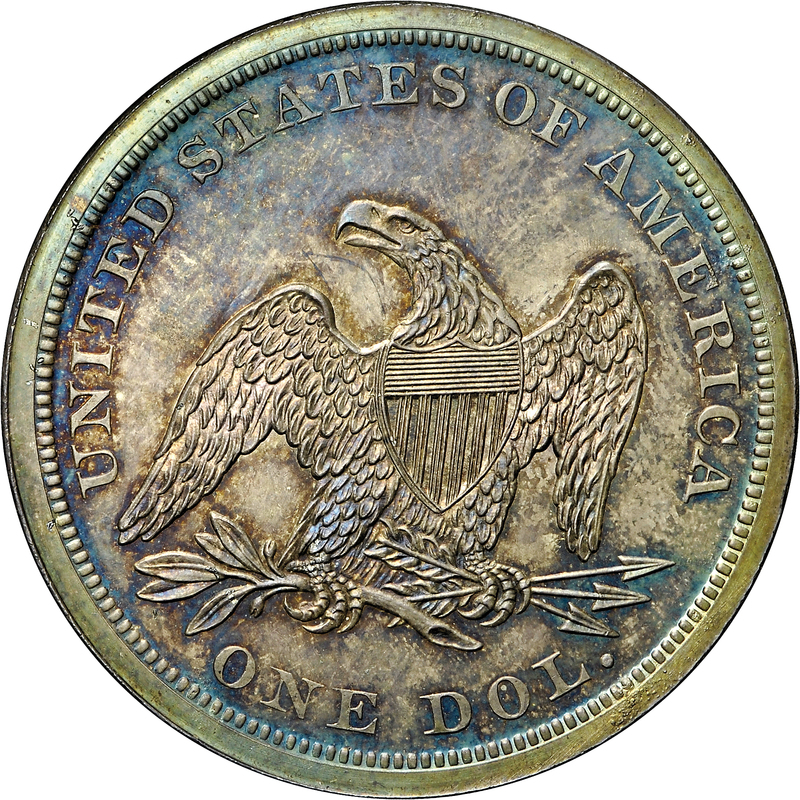 Incredibly, the reverse uses the identical design of standard silver dollars without motto, last used on regular issue coinage in 1866! Andrew Pollock repeated a comment from Walter Breen, that this identical reverse die was used on regular issue Proof dollars in 1858 and 1859. This example is one of just four known silver patterns and was acquired by Harry Bass from the Garrett Collection auction held by Stack’s in 1976. The Garretts purchased this pattern from John Haseltine in 1883. From John W. Haseltine, April 1883; Harold P. Newlin; Stack's sale of selected pieces from the John Work Garrett Collection, May 1976, Lot 655. Liberty seated to left, left hand on globe, ribbon on globe reads LIBERTY, olive branch in upheld right hand, furled flags and wheat sheaf behind globe, sailing vessel in background on open sea, 13 stars around, date below, scroll above date reads IN GOD WE TRUST. 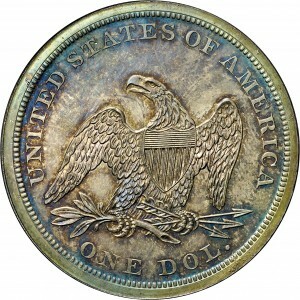 Standard reverse die of regular-issue Liberty Seated dollars of the date. "Auction: Garrett. Trade value: $3,300. Obtained by numismatic trade (#F). Need cost!"